In the wild, most egg laying activity would take place in spring or early summer, to allow the hatchlings to grow a little before their first hibernation. There is, however, no set breeding season for the majority of tortoises in captivity and egg production can take place at any time of year. When a tortoise lays eggs it can be quite an exciting time for the keeper thinking about the prospect of incubation and subsequent hatchling tortoises, but the Tortoise Protection Group recommend that you think very seriously about the outcome before you start breeding tortoises. Given the number of babies that may hatch, have you thought about what their long term future will be? Will you have the space to keep them yourself, or are you contemplating selling them to others? If you are thinking of selling them, please give some thought as to how you will find a suitable new owner who can meet the captive tortoise's needs for long-term care, and think about the advice and support you will need to offer. If you are happy to deal with this aspect of breeding, then please go ahead and breed responsibly and help us to ensure that there are enough captive-bred tortoises in the UK, so that we may try to reduce the massive number of legal and illegal imports that come into our country each year. It is common for tortoises to lay more than 1 clutch of eggs in the year, and the number of eggs laid does vary with different species of tortoise, but as a general guide for Mediterranean tortoises, the average clutch size will be between 2 and 12 eggs. However, depending on the size and species of the tortoise, this can vary between a single egg being laid in the clutch, to 12 eggs or more. For example, Russian (Horsfield) tortoises typically lay 2-3 clutches per year of between 2 and 5 fairly large oval shaped eggs per clutch, whilst the Hermanns (Boettgeri) tortoises typically lay between 5 and 8 smaller eggs per clutch, but can lay up to 12 eggs. 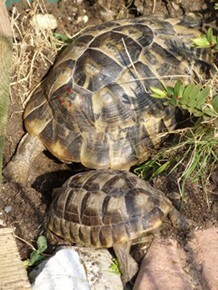 The smaller Hermanns (Hermanni) tortoises only lay 2-3 eggs per clutch. In contrast, tropical tortoises such as Leopard tortoises can produce on average between 6-20 eggs or more each month for up to approximately 7 months of the year. The eggs are large and are similar in size and shape to a ping pong ball. The even larger Sulcata tortoise can lay between 15-30 eggs per clutch 2-5 times per year. Please note that tropical tortoises do grow very large, and as they need heat throughout the year they are expensive to maintain. Please do think very carefully before you incubate eggs from these tortoises, as you will probably need to find suitable homes for them later and this may prove difficult to do. When conditions are right, and the gravid tortoise is happy with her chosen nesting site, she will begin to excavate the nest ready for laying her eggs. She will normally choose a sunny location situated on a well drained slope of soft soil and will position herself with her back to the sun to ensure she gains maximum exposure to the heat, with her head uppermost, and her front legs securely anchored so that she doesn’t slip backwards. Once she is in position, she will commence digging with her hind legs, using large circular movements in an outwards direction. 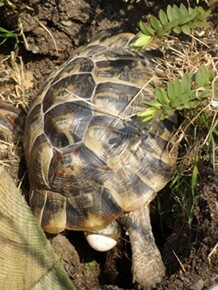 Tortoises often prefer to dig their nests in the afternoon or early evening. 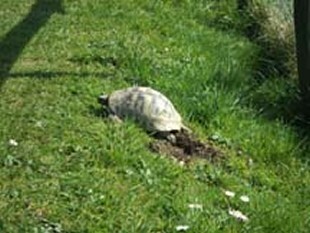 Please note that if a suitable nesting site isn’t naturally available, then the tortoise keeper must ensure that a suitable one is constructed, otherwise there is the possibility that if the tortoise cannot find anywhere suitable to lay her eggs she may retain them - a potentially dangerous life threatening condition. The digging of the nest can take several hours, and during that time, it is very important that the tortoise is left on her own and she should not be disturbed by other tortoises or moved from her nesting area. As she digs, the soil is placed in two piles, one either side of the hole. The nest is a carefully constructed bell-shaped chamber, several inches deep. From observation, once the tortoise can only just feel the base of the hole with legs at full stretch, she will consider this to be deep enough. Once the gravid tortoise is happy with the nest she has dug, she will rest briefly, suspended over the hole, with her hind legs extended. When she is ready, she will begin to pass the eggs. You will observe her extending her neck fully and then pulling her head back into the shell. With the effort of pushing out the egg, her cloaca expands, and the egg becomes visible at the vent. It may take several pushes before the egg is fully out. This gradual passing reduces the risk of the egg dropping out and breaking on impact. 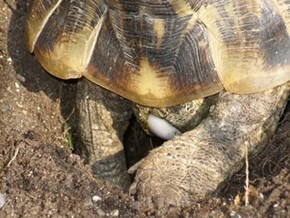 Once the egg is laid, the female tortoise will use her hind legs to gently roll it away out of the way of any more eggs, reducing the risk of breakage. The eggs are covered in a film of mucus, and this rolling also has the effect of coating the egg in a thin covering of soil. Eggs are then not likely to stick together, and in the event that an egg goes ‘bad’ for any reason, there is less chance of it affecting the rest of the clutch. The tortoise will rest for some time between passing each egg, and this process will be repeated until the tortoise has passed all of her eggs. 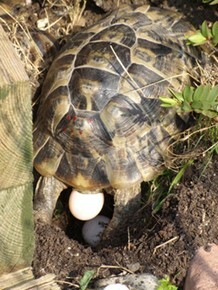 Once all the eggs are all laid, the female tortoise will again rest briefly before starting to refill the nest. She will do this once again using her hind legs, but this time using circular inwards motions, replacing the soil she has previously excavated. Once the nest is refilled, she will smooth the surface over using her plastron, leaving an apparently undisturbed area, well camouflaged from the casual observer! She will leave the nesting site very tired, and with legs shaking from the effort. From this point onwards she will have no interest in the nest. In the wild, in the tortoise’s natural habitat, the tortoise would have chosen the perfect spot where the warmth from the sun and the moisture from the soil would incubate her eggs, and they would also be laid in a place where they would not be exposed to flooding or predators. In the UK, however, it is rare for eggs to incubate where they are laid because the ground and air temperatures are not warm enough, so you may wish to extract them, and transfer them to an incubator with controlled temperature and humidity levels. Before you do this, however, you should attend to your tortoise. She has been through several hours of hard labour, and should be bathed to encourage her to drink and replace lost fluids, kept warm, and offered food. Make sure though that you mark the location of the nest to enable you to find it again later so that you may retrieve the eggs! Once you have done this, you can then proceed to recover the eggs. The eggs should be carefully dug up, remembering that the egg chamber is bell shaped, so a careful check should be made that all eggs are retrieved. You will often be able to feel the walls of the nest as the soil is a different consistency to that which has been dug over. The eggs should not be rotated, but if they happened to be turned gently in the process of retrieval, this will not adversely affect them. Once the eggs are all collected, if you intent to incubate them, they should be gently washed using tepid water and a weak solution of a suitable disinfectant such as F10 to prevent the growth of mould and bacteria on the surface. Mark the top of the eggs with a soft pencil so that they are not accidentally turned later. You may wish to put the date of laying, and also the mothers name, if you have more than one female. So you don’t want to incubate the eggs? If you are not intending to incubate the eggs, the Tortoise Protection Group recommends that you remove them from the nest and destroy them. This is more humane than allowing them to partly develop during a warm period, only for the developing tortoises to die when the temperatures drop again, or to be dug up and eaten by predators such as foxes or magpies etc. If you decide to incubate the tortoise eggs do remember that the incubator does take some time to stabilise. It is a good idea to get it up and running as soon as you suspect your tortoise is gravid, but if your tortoise takes you by surprise, a slightly lower temperature for the first couple of days of incubation is unlikely to do any harm. Please see the TPG article on setting up the incubator and hopefully in a few months time you will have some new healthy tortoise hatchlings.